Mr. R was brought to me in an auto rickshaw. He was not in a position to walk, hence his son and wife were supporting him to enter my consultation room. Before one week, he had gone to a coldest place in south India for a pilgrimage. While returning, he developed pain and swelling of the left leg. He had heaviness of legs with cramp like pain. The whole leg below the knee was swollen and painful. 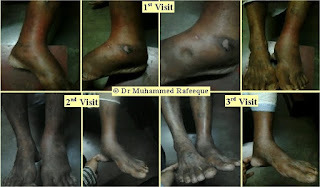 Due to continuous friction of boots, he also got a sore vesicle which finally became ulcerated. He developed fever, for which he took paracetamol, over the counter. Signs: Pitting edema; Dark red skin; signs of poor circulation (Dorsalis pedis pulse and posterial tibial pulse were normal); Tenderness of calf muscles on pressing ++; signs of cellulites. 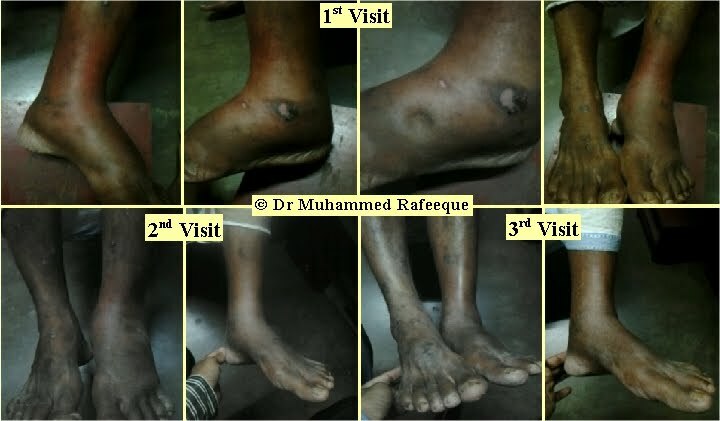 Symptoms: Heaviness of leg; Pain as if the whole leg is full of something; Pain and fullness worse by hanging the foot; difficulty in moving the foot. I prescribed Vipera 30, 4 doses, to be taken every one hour along with plcb. Also given Echinacea mother tincture, 5 drops 4 times daily with water. Also referred for routine blood, platelet count, clotting time and bleeding time, routine urine. In case of no relief of pain and swelling, suggested color Doppler ultrasound to rule out DVT. Asked him to call me next day morning. He did not call me. So, I confirmed that he might have gone to a surgeon. But I received a call in the afternoon saying slight relief of pain and swelling. Asked him to continue Echinacea Q, along with plcb I had given. He had already finished 4 doses of vipera 30. He did not go for investigation due to financial problems; also due to relief of troubles. On the 3rd day he visited me walking alone, without any difficulty. Swelling is almost gone except slight swelling of the ankle. No pitting edema; no fever; no pain on palpation, including calf muscle region. Again given plcb and asked him to comeback after two days. He had no troubles at all.